It’s 2019. Yes, I know by the time you read this it will already probably have been a month of the new year. However, it is never too late to make some changes to help us stay organized in our classrooms, our personal life or even our actual teaching. 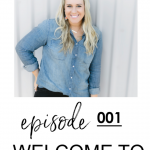 So, I wanted to talk about five easy to implement ways to organize your teaching life this year. I love when it’s a new year because it can truly be a clean, fresh start in so many areas. YES, I also believe you can do this at ANY time in your life and at any time in the year you can choose to start over. You can choose to start fresh. But a new year is almost like the universe giving you that excuse to have a clean slate wherever you need it. I’ve been organizing different areas of my house lately. I kind of went crazy. It’s like when you start one thing and you see all these other areas that you need to organize. So, I completely purged my pantry and I organized every single thing into the exact same clear plastic container. I will say every time I open the pantry I’m like “oh my goodness!” my heart just gets so happy. Then, I went through my closet and I got rid of SO many clothes and shoes. I couldn’t even lift the bags into the car myself. So, that kind of tells you how much I donated. I cleaned out our bathroom cabinets and I trashed and donated so many things I’ve never used or I’ve had for way too many years. When we moved, our bathroom got more storage which is great, but that kind of also means more space to store things you don’t need. I’m embarrassed to say how many lotions from Bath and Body Works I had. Yeah, don’t ask. Then, I went through my drawers and my workout clothes and I didn’t get rid of too much because you know I love athleisure, but I at least organized it. So doing all of this actually got me thinking. 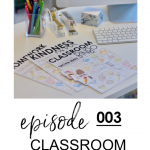 It felt so great to organize my life and start fresh in the areas of my home so I thought it’d be good to get organized in my teaching life too. Hopefully you can take some or all of these quick tips and get organized as well. No, really use your planner. I have a planner for personal stuff. I have an Erin Condren Life Planner (get$10 off your first planner!) and it’s definitely very helpful getting everything organized as far as doctor’s appointments, workouts, meals, or anything going on in my personal life. I don’t choose to merge my personal and my teaching planner. For me, it’s just too much and I like to leave a teaching one at school and take a personal one back and forth. That’s just my preference though, but I’m just telling you to use a planner. I have a planner JUST for teaching related things so that when I have a meeting at school all I have to do is grab it and I’m ready to go! I use a planner that I’ve personally created and I use Happy Planner discs to bind it all together in the teaching planner. 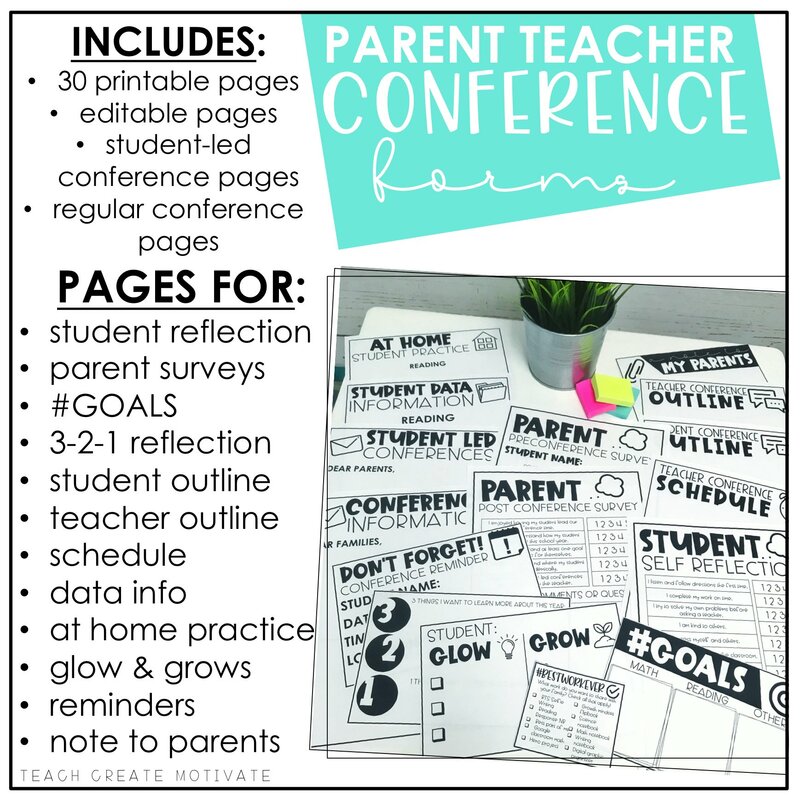 I put all my kids’ information, parent information, school information, notes from meetings and anything and everything I could need to be successful during my day. Then, my personal planner, my Erin Condren planner, what I love about it is that you can set it up to be a specific layout that works well for you. So, then I have both of those with me every day. Then, if I need to take my teaching planner home I do, but ultimately it stays at school. So, I think that teachers are notorious for buying all the planners. But, even if you want to use a digital planner or your Google Calendar or something else that works for you…a journal, a notebook- whatever it might be, use it to help yourself stay organized. Statistics do show that you are way more successful when you write things down, so this could be anything and everything…your workouts, your meals, your to do lists, your meetings, your copy list, or your lesson planning. Having a planner and using it is going to set you up for success. I know that I can get into the habit of just making tons and tons of lists on my notes app on my phone. Yes, I love the notes app because it syncs with all my devices, but I’m telling you that when I have fifteen notes I’m not being successful because I’m having to go find all those things that I wrote down in different places. When you use your planner for teaching and personal life, you’re helping yourself with your time management and when you manage your time you are having more time for the things that you love and using less time for the things that you might not like so much. It can improve your productivity and you are way more productive when you have a plan. I know that for me especially it is an instant stress relief when I write something down in the right place that I know I’m going to need to do, I know I can go back and get it completed. When I’m just having them all in my head or my phone or in various places, I am STILL stressed because I don’t have it in a specific place with a specific plan. My last tip about planners is to find something that works for you. So, not everybody is going to like or want to use the same brand or type of planner. 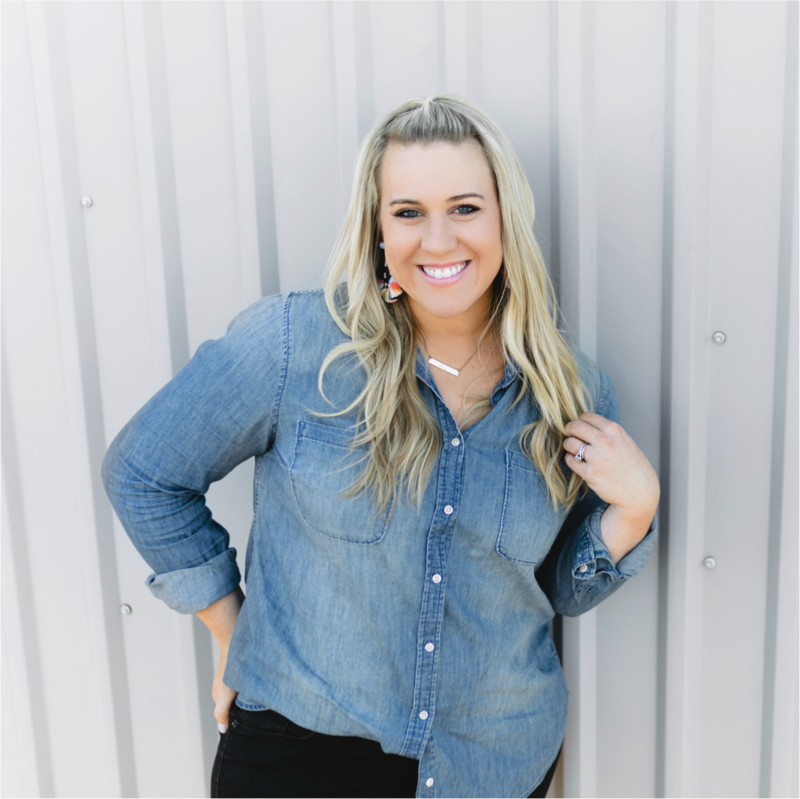 I know that Target has really great planners and then there is Plum Paper Planners, Happy Planners and Erin Condren Planners and planners you can purchase and print for yourself. Whatever it is you need to first of all, really enjoy it because if you don’t like it you’re not going to use it. Then, make sure that the layout is something that works for you and your schedule. So, I personally need to have a page that shows the full month. Then, I also need daily boxes with different categories so that I can successfully plan my time. HERE is the one I’m using for my teacher planner this year and I love it. No, I’m serious. 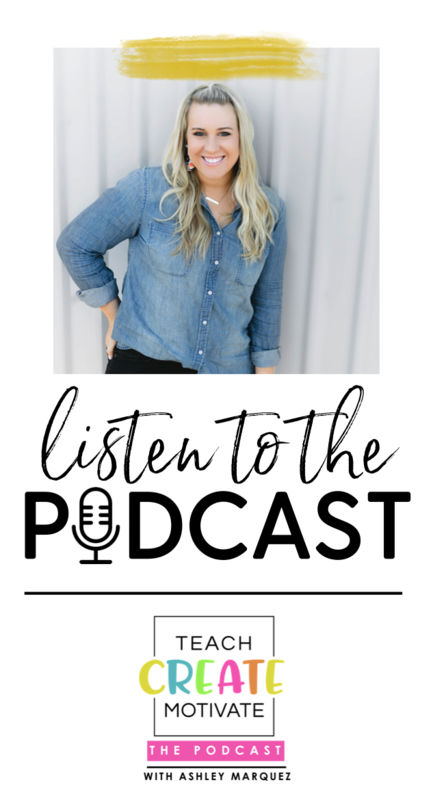 I mean we’re all going to repeat ourselves from time to time and it’s impossible to get rid of that, but I PROMISE you I have a way to help you stop repeating yourself as much as you are during your day with your kids. If you take anything from this episode please take this. I know a lot of you are already doing this, but maybe you’re like me and sometimes you do this and you’re great at it, but there are still the days where you forget to stop repeating yourself. Put your instructions on your board. Now, I don’t really mean write it on the board. You totally can do that, but go into Powerpoint and make a slide with your instructions-your “everything you need to know about this activity” slide. Your kids need to know the reminders. Do you want to continue to tell them fifteen times during that math activity what to do, what to do when they’re done, and where to put it when they finish?! I don’t. So, I obviously explain to my students all of this stuff, but then I put a slide up that has everything I’ve already told them on the board. I’m telling you RIGHT NOW your kids will learn to reference this slide for what they need to do or where they need to put it when they’re finished with it. And if you follow me you know that I personally use slides WITH timers in them. This is something that I’ve worked very hard to create to serve you in your classroom and they are LIFE CHANGING. The amount of times that my kids ask me what to do is significantly lower now that my kids know to check the board for the instructions and to check the board for how much time they have left. Students THRIVE on consistency and they meet expectations that you set for them. So, if you’re thinking “Oh no! I’m gonna have to tell my kids over and over, their first graders!” or “No, you don’t know my class! You don’t know my class!” Well, I PROMISE you, if you just get into the habit of putting these instructions up for them every time… I’m talking like every time you have them working on something put another slide up, put another document up. Whatever you want to use! It doesn’t have to be fancy, it doesn’t have to be cute, but do something that you’re putting on the board for them. With the slides with timers specifically, your students will learn to manage their time. I overhear my kids say to each other, “Hey, how much time do we have left? Oh, three minutes” or I’ll even hear you know those certain students that love to be in the know, tell their group, “Guys we need to get to work. We have five minutes left to finish this activity.” So, I promise you it’s foolproof. IT WORKS! I’ve tested and tried it for many years in my classroom. Get organized in your everyday teaching by not repeating yourself. HERE are the timers I use…be prepared to fall in love! Okay. Hear me out. I know that can sound overwhelming or you might already be doing this, but whether you have one device or your kids have a device class set for every student, try going more digital. Going digital with activities in your classroom creates high engagement for your students and it’s very easy for you to plan and implement. Which then leads to you being more organized and stress free. 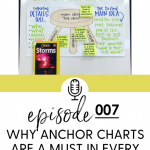 I’m telling you it might be overwhelming at first, but once you see how beneficial going digital is in your classroom it will make your job easier. I use ChatterPix. It’s an app and I use that in science and social studies to do a quick check in with my students to see if they’re understanding what we’re learning about. So, I could use it about planets or Rosa Parks or any public figure or any topic. It’s just super easy! The kids just take a picture or use a picture you’ve given them and they make that picture come to life by talking in the form of that person or object to see how well they’re understanding. Pic Collage is AMAZING! It’s another free app that I use for vocabulary. The kids make collages with the words based on their definition. They find pictures that go with the words or they might write a sentence in the pic collage. It’s awesome! If you’re not on board with Google Classroom, I highly recommend it. I use it for SO MANY things!. It might take you some time to learn, but your kids will absolutely love it. And again helps you stay organized with certain assignments. Flip Grid is an app that we started this year. It is video discussion responses. THIS. IS. AWESOME. So your kids can just respond with a video based on a question that you’ve asked them. So, why do I relate digital to being organized? Because it’s so easy to assign things and to look over it and to see if your students are understanding. You’re going to be more organized in your lesson planning and your grading and just your overall stress level. 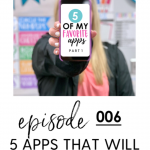 All of these ideas you can use with ONE device if you don’t have a class set.The best advice I have for this is to rotate your kids through the digital activity that you’re assigning them during a station time or an independent work time. So, just make sure that they all finish it throughout that day or even the week. A lot of times I give my kids an assignment to do from Monday to Friday.So if you only have one or two devices you can easily let them accomplish this task by rotating them through during the week. It can be overwhelming to learn new digital ways of teaching, but what I recommend is start with ONE thing and learn about it and implement it. Don’t get frustrated-your kids will get it. They learn new things so quickly and like I said when you set that bar high they meet our expectations. The engagement level will blow your mind and you will feel way more organized and on top of everything. 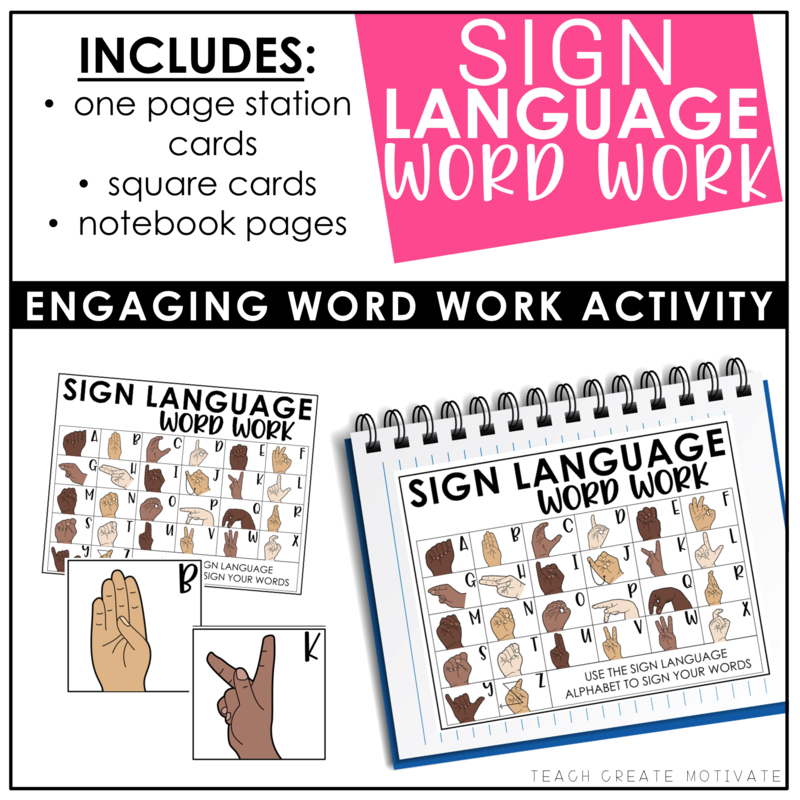 HERE are my digital graphic organizers to help you get started! We have probably all done this, but we most likely don’t stay consistent with it. I’m just here to tell you again. Make your breakfast and your lunches the night before and lay out your clothes. Yes, we’re teachers. So, laying out our clothes is totally something that would help us in the morning… just like our students probably do that the night before too. 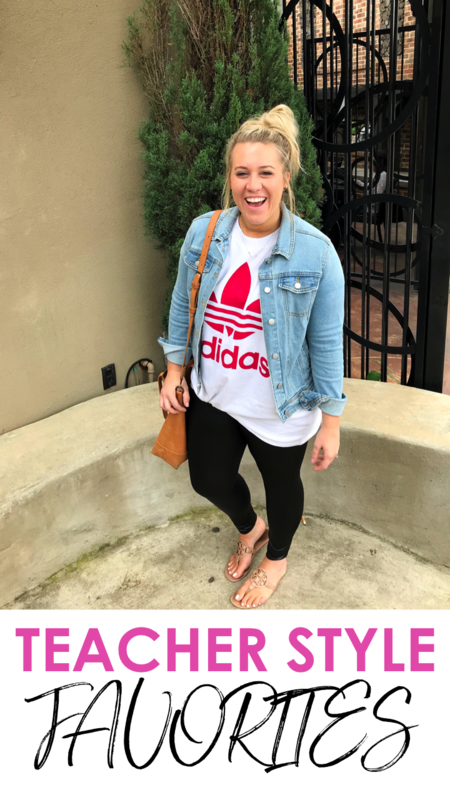 But honestly, when I lay out my outfit for the next day, and when I have my overnight oats already made, obviously they have to sit in the refrigerator for me to eat them the next day, or have a breakfast shake or a breakfast bar to grab… it just helps so much more to get me started on the right foot for that day. I personally make our lunches on Sunday and then what I do is every night before the next day of work, I pack the lunch boxes. So, I might make the lunches, but then I put the cheese sticks and the snacks and the drinks and everything I need for our lunch in the lunch boxes the night before and just stick the lunchbox in the fridge. So, all I have to do on my way out the door is grab the lunchbox. When I don’t do this I feel a little flustered in the morning because I’m having to run around and grab everything. I do think that that can affect your morning and then your day. So, when you lay out your clothes, when you pack your breakfast and you make your lunches ahead of time…your life, your day, your week will be more organized. O M G. If you take anything from today take this. You’re probably thinking “How the heck will this help me get organized?” Oh, you just wait! I truly don’t know why this took me so long to do. Okay, wait. Yes I do. I thought it would be so much more work for myself assigning, managing, hiring, and explaining class jobs. Okay. Whoa. I was wrong. This is one of the BEST things to happen to our classroom this past year. So take it from me, it’s worth it. I used to have just two class helpers. Just two of them who did everything I would even tell people “Nope, I just have two helpers. They do everything it’s so much easier!” However, I decided to go to full on class jobs and it’s taken loads off of me in the morning, during the day, and at the end of our day. 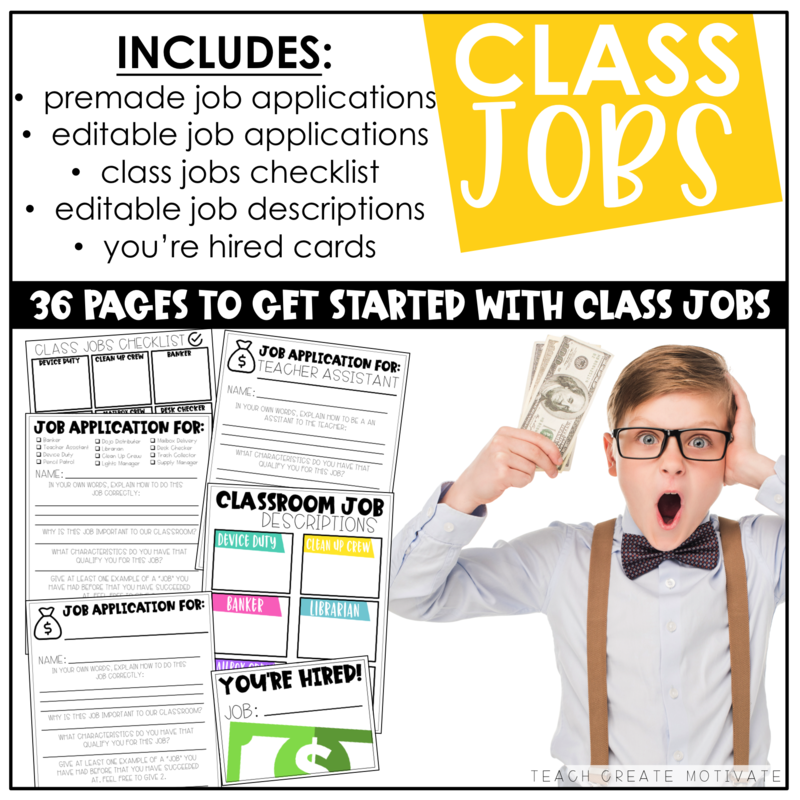 I’ll be doing a full episode on student class jobs later, but for now if you want to get this up and running just start start with some areas you know your class needs and get them going. You will thank me later! If you’re wanting all the information on what I do in my class, then check out this blog post! So there you have it. 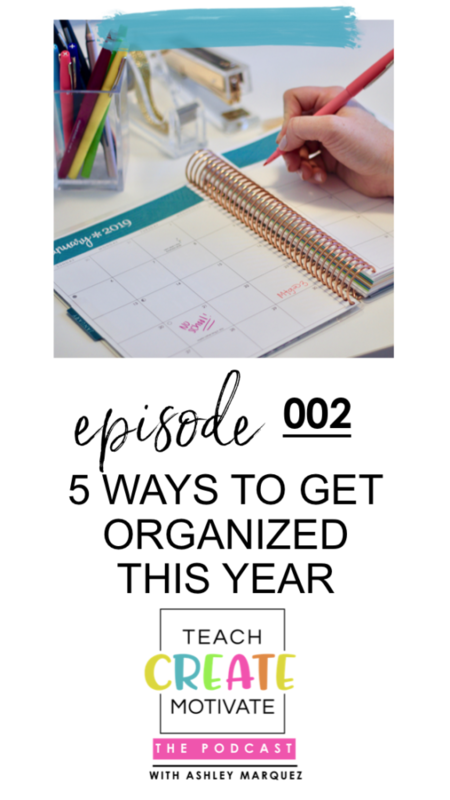 Five things you can easily implement or apply right away to get you more organized. I hope at least one or two of these tips can help you in the new year. When you’re more organized you have more time and energy to do the things you want to do and that mean the most to you. Which then makes you a better version of yourself for you and your students. Right click and save as to download this episode to your computer. Previous Post: « 001: Welcome to the Show!